Moscow is witnessing a surge in bike culture, with the number of rental outlets and bike parks rocketing, and even cycle lanes appearing. However, the phenomenon is not limited to the capital – people are switching to alternative modes of transport in other major Russian cities as well, though long distances and problems with road safety continue to hinder the growth of cycling culture. 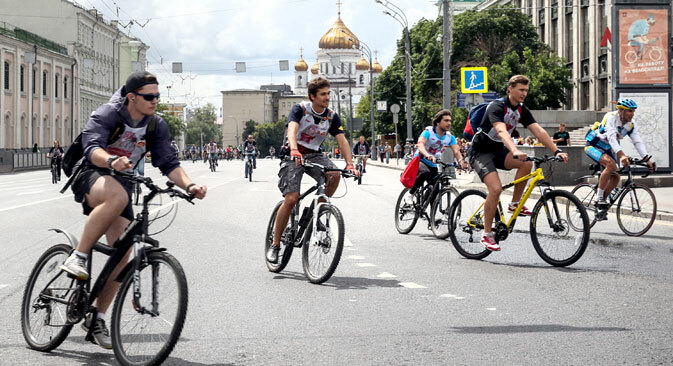 It may not seem that way, but a cycling revolution is quietly underway in Moscow. Following in the footsteps of cities all over Europe, more and more of the city’s residents are beginning to abandon public transport in favor of bicycles and scooters. In the last five years the Russian capital has seen a serious growth in demand for bicycles, with around 150 rental points now in operation, forecast to balloon to 300 by the end of the year. Besides bike rental outlets, there are also now 755 bike parks in the city, and even cycle lanes are beginning to appear in some districts. While riding, Konstantinova strictly observes the traffic rules, i.e. in the right-hand lane of the road, within one meter of the sidewalk. According to her, difficulties for cyclists in the city are often created by improperly parked cars that obstruct passage, as well as a lack of bicycle parking areas where it is safe to leave her bike. “I have to tie the bike to fences and poles, which hinders pedestrians,” said Konstantinova. Konstantin Trofimenko, a senior researcher of the Institute of Transport Economics and Policy at the Higher School of Economics in Moscow, notes that alternative non-motorized forms of transportation such as bikes and scooters have become popular in recent years in Russia. In Asia, people ride bicycles because they cannot afford to buy a car. In European cities, buying a car is not a problem, but all that a city dweller needs – work, entertainment venues, shopping and recreation facilities – is typically within 3-5 km of their home. The most convenient way of covering this distance is on a bicycle since it takes too long to walk, it is expensive to go by car (petrol and parking fees), and if you opt to use public transport it is necessary to time your trip to the schedule. Yet Russian cities are built according to the so-called “Soviet type”; work and entertainment is in the city center, with residential – or “sleeping” – districts located on the outskirts. “To go from a ‘sleeping’ district to the center is too far (10-20 km), so citizens rarely use the bicycle as the main mode of transport,” said Trofimenko. “In Russia bicycles and scooters will become more popular with citizens as the decentralization of cities gradually progresses,” she said. A person riding a scooter is still considered a pedestrian, so he or she can go on the sidewalk and it is safer than a bicycle, says Vladimir Sokolov, the chairman of the Pedestrians' Union, an interregional public movement for the rights of pedestrians. “Cyclists are required to go on the roadway or on the bicycle path, if any,” he said. According to Sokolov, for a cycling movement to begin to spread on a large-scale in Russia, the maximum permitted speed for cars in the city should be reduced to 40-50 km per hour. It will also require the introduction of compulsory lessons on traffic rules in high schools, which will be carried out by police officers.